Our most popular condo is the two bedroom (2BR) floor plan. This spacious unit provides 1052 square feet, and includes 2 bedrooms, 2 bathrooms, a full kitchen, washer and dryer, gas fireplace, and a gas BBQ on the deck or patio. Sleeping 6 people altogether, the master bedroom has a king bed, the second bedroom provides 2 twin beds, and the living area features a Murphy bed. We have arranged for free wireless internet access, in-room, using our owner’s account (a $20 value). 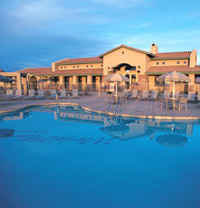 Please click here to see current availability, prices, payment options, photos and other information regarding Worldmark Rancho Vistoso Resort condo vacation rentals.